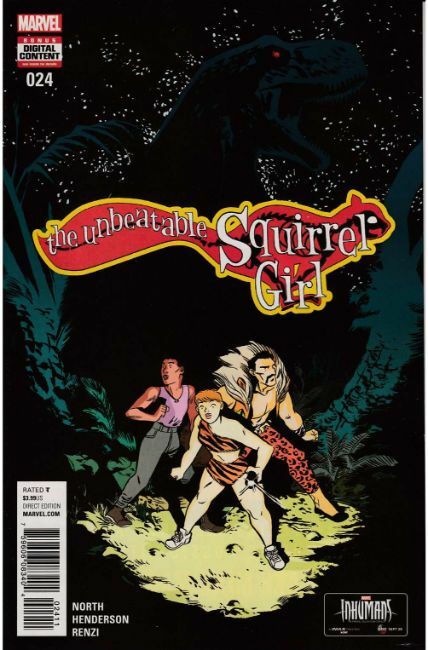 • Squirrel Girl, Nancy and Tippy are trapped in the Savage Land! Good thing there're only regular dinosaurs there and not, for example, a giant metal killer-dinosaur version of Ultron instead!! • Sorry, I'm just getting word that there is, in fact, a giant metal killer-dinosaur version of Ultron here, and Squirrel Girl needs to stop him before he takes over the world - a task that has regularly bested many other super heroes, including the Avengers themselves! • But don't worry, because SQUIRREL GIRL IS NOT ALONE: She's got Nancy (a regular human with no powers) and Tippy (a regular squirrel with no powers) on her side to help her out against the rage of Ultron! • And it's not just any Ultron, but a new and improved Ultron with an extremely dangerous (and, we must admit, extremely awesome) Tyrannosaurus Rex bod! • Oh, also Kraven the Hunter is in this issue too, so if you love dinosaurs, robots AND men in lion vests, boy howdy have we got a comic book for you!